We are passionate about working hand in hand with parents to develop strategies to create and maintain healthy habits for their children. Early education is essential in creating a lifetime of healthy smiles. Together with parents, we aim to empower our patients to make good choices and be proactive in caring for themselves. We believe that pediatric dentistry is more than just having a doctor "clean your child's teeth" or "fix your child's cavities". It is about forming relationships, being the same face your child sees from his/her first patient exam to the day we send them off to college. It is about treating your children with the same gentle touch and compassion as we do our own. 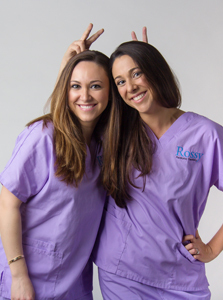 At Rossy Pediatric Dentistry we want you and your family to become a part of ours! 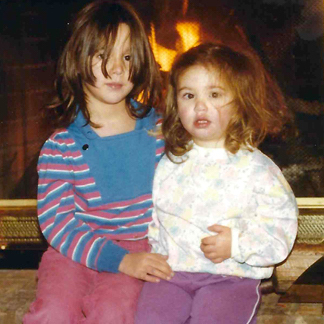 At a super young age (probably 3 years old), Danielle began to answer the “What are you going to be when you grow up” question with a confident, “I want to be a dentist when I grow up”! I, however, answered like many other children do, with things like, “princess” or “artist”. 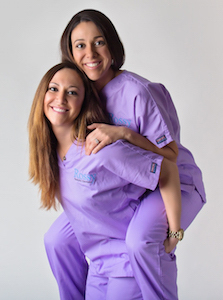 Sharing a bedroom for our entire childhood gave Danielle the perfect opportunity and plenty of time to convince me why being a dentist was a way better idea…and why being dentists together was the BEST IDEA EVER!! Before I knew it we were making plans! Right there, amidst our “Precious Moments” wallpaper and our National Geographic Junior posters, Rossy Pediatric Dentistry was forming! After individually wonderful journeys and amazing life experiences, tedious training by passionate mentors and years of experience in various types of dental practices, we decided that it is time to do this!!! We are “all in” on making our lifelong dream a reality! 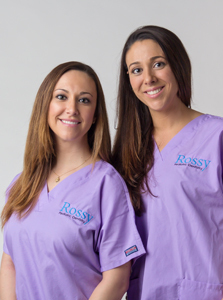 So what do you get at Rossy Pediatric Dentistry that you will not get anywhere else…sisters, best friends, dreamers, achievers, teammates since birth committed to making a difference in you and your child’s lives! Our parents taught us very young the importance of using our gifts to give back and strengthen communities. As dentists, we have been given an incredible opportunity to be able to use our knowledge and our training to help others less fortunate. Participation in events, such as "Give Kids a Smile" and community health fairs, allows us to provide dental services to local children in need. We have also been involved in dental service trips to areas without adequate oral healthcare for children, such as a Native American reservations, and schools and orphanages in Cambodia. We are always looking for new ways to participate in community outreach and would love to hear if you have outreach ideas where you believe our skills and training can be put to use! Let’s make a difference together! I grew up in Metuchen, New Jersey. My husband and I currently live in Essex County but are looking forward to eventually moving closer to Randolph! When we’re not working, we enjoy trying new restaurants, traveling and attending as many country music concerts as possible. We LOVE LOVE the New York Giants! I received my Doctorate of Dental Medicine from Rutgers School of Dental Medicine. I then went on to complete a two year pediatric dental residency at LIJ Medical Center, Cohen Children's Medical Center in Long Island, NY. I obtained my board certification in pediatric dentistry shortly after completing my pediatric dental residency. “Being a pediatric dentist is the most exciting job in the world! Everyday I have the opportunity to meet and to care for so many wonderful children. I get to sing, and tell stories and jokes and help all my little ones realize that getting and staying healthy can be fun!" I grew up in Metuchen, New Jersey. My family and I recently moved to Randolph and couldn’t be happier with how wonderful and strong the community has proven to be. My husband, Kevin, is a partner at Barrish & Lehnes Orthodontics. Growing up in Chester, he formed a great love of the area and always knew he would someday be back. Kevin and I met and fell in love in dental school. We are now blessed with three amazing children. Carina is our oldest. She loves dancing and “pink” ice cream. Our twinners, Christian and Lilliana, love making each other laugh and climbing on everything. When I’m not working, you will probably find me somewhere outdoors with my kiddos. We love going to parks, farms, and zoos. We enjoy long walks around our neighborhood and lots of chalk drawing on the driveway! I obtained my Doctorate of Dental Medicine from Rutgers School of Dental Medicine. Afterwards, I completed a two- year pediatric specialty training program at Columbia University- New York Presbyterian Hospital. I am proud to have earned my board certification in pediatric dentistry shortly thereafter.